When importing a 3D object created in a 3D modeling application, such as Maya, Cinema4D, Blender or others, the 3D object can appear much larger than the scene. To use the object, you would have to scale it manually, which is cumbersome and prone to errors. This is because 3D modeling applications use different base units than Storyboard Pro. For example, Maya works in centimeters and Blender works in meters. When a 3D model is saved, the base unit is not necessarily included. When importing the file, Storyboard Pro does not know which base unit was used. 3D objects will appear huge or tiny when placed in a scene. By pre-scaling the 3D object before placing it in a scene, it should come in at the right size. It is still possible to change the scale factor of a object in the library even when an instance is already in the scene. Its scaling will be changed for each instance in the scene. When exporting the project. the scale factor of the 3D object is retained. The value you set will become the default Scale Factor used when you import subsequent 3D objects. If you are importing a large number of 3D objects that were created with the same 3D software, it may be more efficient to set the Scale Factor in the Preferences dialog box. This way, the Scale Factor is set on a project-wide basis—see Project Settings Preferences. 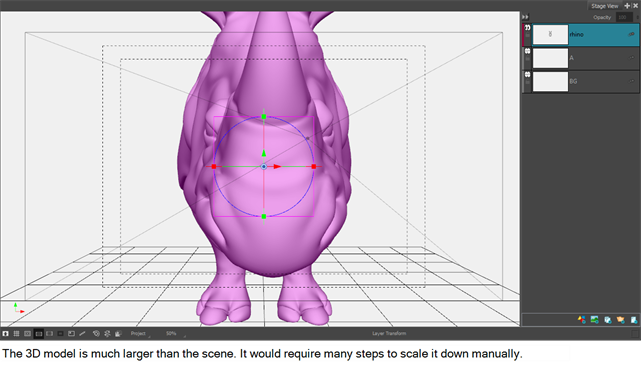 3D objects will scale according to the scale factor you set. However, its value will not appear in the transformation values. You can reset the transformation of the 3D object without affecting the scaling done by the pre-scaling. After you have imported a 3D object and placed it into a scene, the scale factor you set will not appear in the transformation values. You can reset the transformation of the 3D object without affect the scaling done by the pre-scaling.